This time last year some of the worn outters met up on a beautifully warm May evening at the RHS Chelsea Flower show. In the space of a few hours we looked at a very few floral displays as we were too busy catching up in person, admiring each other’s clothes, bags, shoes, hair and make-up, (am still trying with the smokey eye). We rounded off the night with drinks and dinner at Bluebird. It was one of the highlights of my year. I don’t get out much! This year I have been lucky to obtain tickets being the centenary and am dragging DH along for a few hours of “us” time. No smokey eye or handbag discussion. So I started off my morning hoping to wear my newly discounted purchase. Carol from the BBC weather put me right off. Torrential rain, strong winds and unseasonally cold day ahead in London. Great. As I don’t do cold I’ve resorted to Reiss again and to brighten up I am wearing Paris cobalt blue trousers, similar here Paulie cream silk tank top and Callas jacket plus thermals short johns (not shown of course) The floral dress will be worn out when the Sun finally arrives. 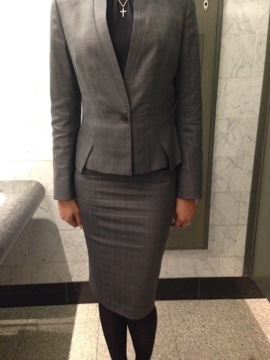 This entry was posted in Workwear and tagged Anya Hindmarch, LK Bennett, Reiss on May 24, 2013 by Mon WornOut. Fridays are a bit more relaxed in corporate attire but not in workload. The ever elegant and incredibly stylish Tracey found this dress last year. I could not resist. It is the Whistles Marla dress. Oh how I wish Whistles would re-issue this dress and in another colour – cream for Summer please. It’s a really great fit, the sleeves are long enough for me and I love the mini Dynasty shoulder pads. No photo of me wearing it though, sorry. No time, just too busy. 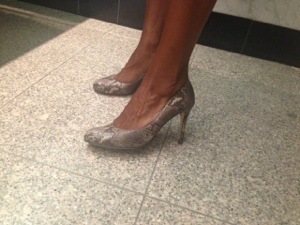 I wore my Marla with opaques and the LK Bennett Una shoes. 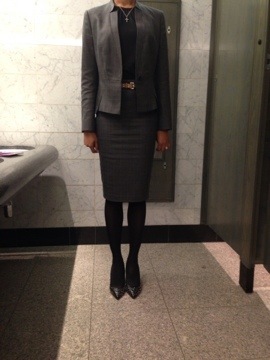 So here I am on Thursday wearing a grey skirt suit from Reiss. I am not really into peplum but as you can see the Axel jacket is trying to be different with the pep feature at the edge. The top is Zara, slightly puffed shoulder in style and very old. A very similar top here.. It’s long in length so I have tucked it in and put a belt (old from Reiss) around the waist. I make the most of the suit by wearing the Axel jacket with a dress or cropped black or navy trousers and a cream silky t-shirt. The Harper skirt skirt has been worn with a thick black, cream or bright blue jumper and often with the cream blouse I had on last week. Shoes? DVF Alaina as worn before and for many more days and nights to come. 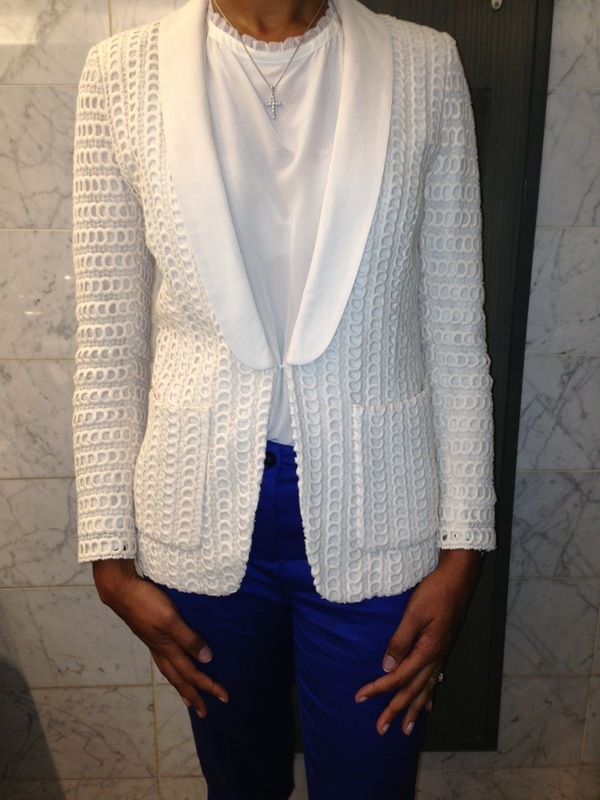 Zara Navy Boucle Jacket worn with Zara “Victoriana” high collared white shirt. Please do not ask me to find the links on their website as that is a massive task in itself but here is the link to current Zara blazers. Trousers are from Gerard Darel as worn last week and mistaken for Black. Belt is as before from Reiss. The shoes are from Jones the Bootmaker and are called Callaghan. A cheaper version of the LK Bennett Shilo. The heel is much thinner and tend to wear out too quickly as seen here. I stepped into a loose pavement slab, ripped the leather and made an emergency and very tacky repair with Sellotape. This entry was posted in Workwear and tagged Gerard Darel, Jones the Bootmaker, LK Bennett, Ma Boutique, Reiss, whistles, Zara on February 23, 2013 by Mon WornOut. I spoke too soon about the Sun. It came and disappeared as quickly as the weekend so please accept my apologies for daring to mention brighter days ahead. Today I have decided to pay a little tribute to the Simone suede shoe boots from Sam Edelman. I am a shoe fiend, buying when and where I find a pair that comfortably, reasonably, errrrr make that simply fit but, oh my, they are just perfect. They have been worn out literally with everything from dresses, skirts (both maxi and mini), cropped trousers, long trousers, jeans and even a jumpsuit (still have one or two of them lingering in the wardrobe). 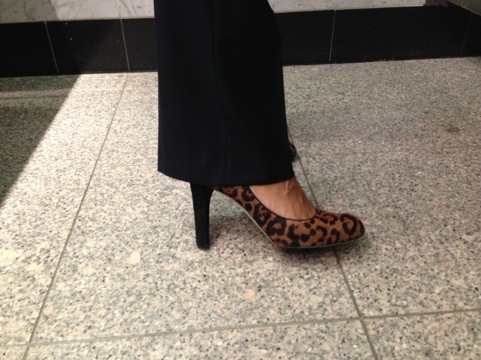 I like the fact that they are not only very comfortable and versatile but have a mid heel to tolerate my heavy walking. Don’t you find the bigger the shoe size the higher the heel or is that just me? The suede is oh so soft and easy to keep clean. How could I forget their name last week as there was deep discussion amongst us worn out women on purchasing them a couple of years ago? So with the opaques and the layers of thermals back on too I am wearing the shoe boots with a very old Gerard Darel via Ma Boutique grey wool shift dress in the office. No link as so old. 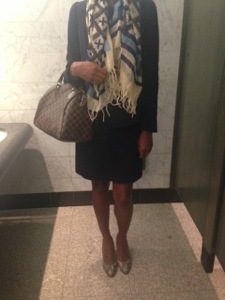 I will quickly swap into the LK Bennett Una for meetings today and remove the scarf. Great news that they too are available in a size US 11 (UK 9). I know they will fit. A quick and happy shoe purchase will be made before the end of the dreary outlook for this week. Anyone for a heavily discounted size 8? Salina suede shoe boot by Sam Edelman. There are many versions of this style of shoe boot. I like the heel on the Jigsaw version, the sizing is not so generous. This entry was posted in Workwear and tagged Gerard Darel, Jigsaw, LK Bennett, Ma Boutique, Sam Edelman on February 19, 2013 by Mon WornOut. That’s right. You saw it here first. No opaques today. Yeeeeeee-ha hippy hi hum, Summer here we come. I am that person you see at the train station wearing a woolly hat and scarf in what we deem to be warmer months, May, June and yes I admit to stretching winter woollies into July. I just don’t do cold and the outside temperature must be 30c plus (for me) to feel warm but today does not require the warm and trusted opaques. I have been searching for this coat in my size for ages. I found my normal size in the sale just after the New Year but it was way too big. Told you Gerard Darel is a generous fit. Anyway, arriving home last night to find a delivery, no red roses for me but the GD in my size, all wrapped up for V day! Joseph Cashair cobalt blue jumper with an American Vintage Navy vest worn underneath – the Jumper is quite sheer. Joseph Cashmere pink scarf (very old), similar here. 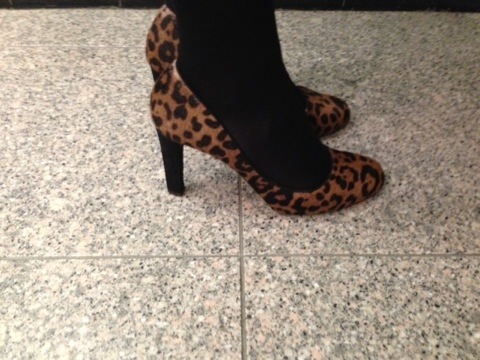 LK Bennett Una Leopard print heels, high but oh so comfortable. 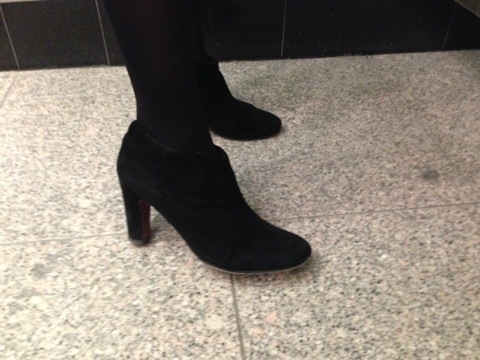 Sam Edelman black suede shoeboots, worn on the walk to work. I swapped to the LKB Unas in the office. Lovely shoeboots by the way. Can’t remember the name, help me oh fellow readers, but the Sam Edelman Salinas are very similar. 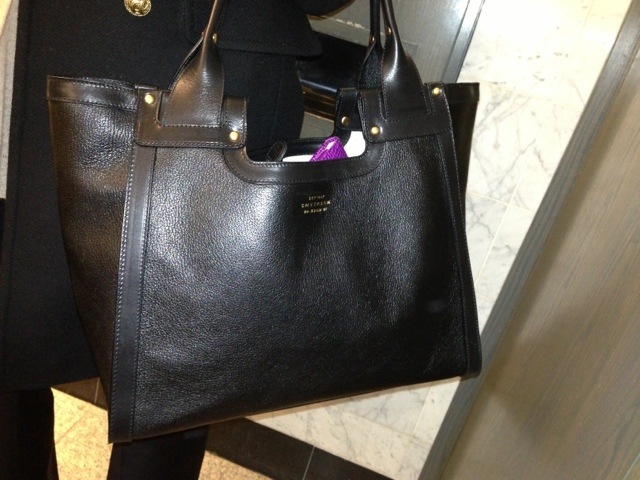 Bag is the luxurious Symthson Cooper Tote Tote. Have a great weekend, the Sun might be out tomorrow. This entry was posted in Workwear and tagged Gerard Darel, Joseph, LK Bennett, Sam Edelman, Smythson on February 15, 2013 by Mon WornOut.